Go! Go! Go! Or No Go! Go! Go! Now, you may look at the title and be saying to yourself…HUH! This entry is not about whether to go to Walt Disney World or not! I believe I would have to relinquish my status within the fabulous Disney community if that was the debate. No, this is about how you decide to tour the resort. Do you hit the ground running like a platoon of commandos? Or, do you like a more leisurely pace what is the order of the day? There are more than two trains of thought on how to handle the parks. And, don’t forget that there ARE things of interest outside of the parks to occupy your time. Commando Style of touring means hitting rope drop no matter what! Breakfast may be an optional meal for those who are aiming to make certain rides and attractions at certain times. These folks carry spreadsheets and touring plans. Everything is laid out and there is very little, if any, room for augmentation! You know going in that your first stop is a FastPass machine (may be a thing of the past, soon). Then you hit a few of the main attractions, before going back to cash in that FastPass. Your constantly moving all around the park to get everything done in a day! If you’re lucky, you get a 30 stop for food, and a 3 minute bathroom break along the way. I don’t know about anyone else, but I’m tired just typing all of this up! The Leisurely plan allows for a few change-ups along the way. Sure, you may still make rope drop, but you will either eat a little something in your room, or grab something at a Counter Service and sit to take in the surroundings. As you stroll from one attraction to another, you may take a moment or two looking at some of the details that are put into the facades and queue lines. After all, Disney is in the Details! You may not finish an entire park in one day, but you will have relaxed and really enjoyed your day. Some may blend both of these styles and make them work according to what day they visit a certain park. And, depending on how much time your vacation allows will be critical in determining how you tour the parks at The Walt Disney World Resort. It seems the shorter time that we have, to more we feel the necessity to hit it and keep running! There are some really good resources available to help in the planning, regardless of the style you may choose. One place is at http://www.touringplans.com. Touring Plans is the brainchild of Len Testa, one of the co-authors of The Unofficial Guide to Walt Disney World. They have crowd calendars, suggestions, touring plans for all types, and an optimizer that you can use while in the park that uses current wait times to help you navigate your way around the park. 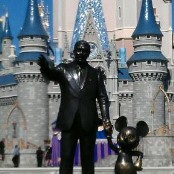 Another fabulous site is http://www.easywdw.com. Here, you are given an everyday guy’s view of what goes on at WDW. This site also has some calendar information, and some planning tools. I love to read his postings on a regular basis as it feeds my own Disney habit, and the pictures really help to understand what he is doing. If he visits a restaurant, you get a picture of the current menu with prices. Whatever your style of touring the parks of WDW, if you can look back and say you’re satisfied, you’ve had a great Walt Disney World vacation. Thanks for reading! Have a blessed and magical week! Author threestrandswdwPosted on 10/29/2013 Categories Disney memories, Disney World Planning, Disney World Trip Planning, Trip Planning, Uncategorized, Walt Disney World TravelTags Planning, Plans, SpreadsheetLeave a comment on Go! Go! Go! Or No Go! Go! Go!